For over a hundred years adults have been entertained by 'Spook Shows'. Ghost stories and horrific tales of the supernatural have thrilled and terrified us throughout history. Here is a modern day theatrical presentation, ideal for relatively small audiences (100 or fewer) in Arts Centres, Colleges, Studio Theatres and Stately Homes. 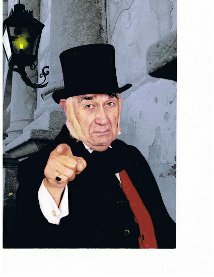 Presents a programme of "Terrifying Tales!" Gruesome stories of Murderers, Madmen, Vampires and Ghosts! Featuring a collection of grisly artifacts, gathered over years of research into the macabre minds of the mentally deranged; he explains how a harmless rag doll was used to commit murder, and demonstrates that a human eye, gouged from its socket still has a strange power to foretell death! 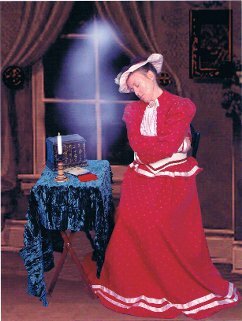 A dramatised Spirit Cabinet presentation; re-creating a private séance that took place in late nineteenth century London. Physical manifestations, replicating the happenings of one night in 1868 are performed under rigorous test conditions! DEATH MAY NOT BE THE END! What is a Spirit Cabinet?